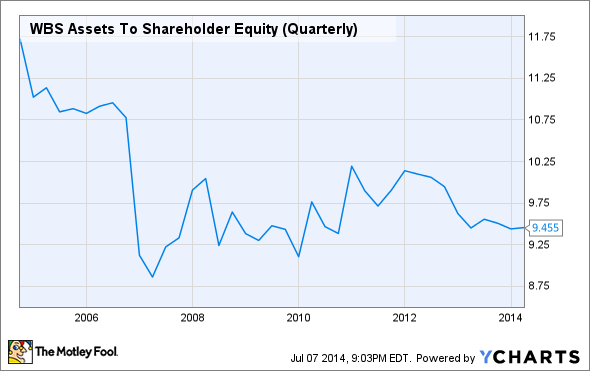 Does Webster Financial Corporation's 2.6% Dividend Justify a Buy? Breaking down an potential investment in Webster Financial Corp in a quick read. Editor's note: A previous version of this articled stated that NPAs were 7.2% of total assets as opposed to 0.72%. The Fool regrets the error. Over the next month, banks will be releasing results for the second quarter. In advance of these releases, let's take a moment to review the state of some of these banks as of the end of Q1. In this post, we'll look at Webster Financial Corp. (NYSE:WBS), a $21.2 billion bank headquartered in Waterbury, Conn. You can find information on other banks at my Motley Fool article feed, available here. All data in this analysis was sourced from the FDIC's Quarterly Banking Profile and Capital IQ. When I evaluate banks, I follow a model made famous by former Wachovia CEO John Medlin: soundness, profitability, and growth. As investors, we then take a look at valuation and the potential for investment after gaining a better understanding for each bank. Soundness refers to the bank's asset quality. Generally speaking, this means loans. If a bank makes loans that are never repaid, that bank will fail, and fail quickly. The best banks put risk management first, ensuring that shareholder capital is protected if a portfolio of loans turns sour. To measure this, we'll look at both non-performing assets and Webster Financial Corp.'s provision for loan and lease losses. A simplified definition of non-performing assets is loans or other assets that have fallen seriously delinquent or are in foreclosure. The provision for loan and lease losses is a reserve of money that the bank pulls out of its income each quarter to guard against future losses in the loan portfolio. Banks are required by regulation to maintain certain levels of reserves, but within that, management has plenty of wiggle room to over- or under-reserve. Over-reserving increases protection but hurts net income; under-reserving increases risk but keeps net income high. For the quarter ending on March 31, Webster Financial Corp. had 0.72% non-performing assets as a percentage of total assets. The FDIC reports that banks with total assets greater than $10 billion on average had 1.47% non-performing assets as a percentage of total assets. Webster Financial Corp. reserved $9 million for the first quarter, which represented 4.4% of operating revenue. That compares with 5% for the $10 billion-plus peer group, according to the FDIC. Taken together, Webster’s soundness profile looks strong. The company has next to no non-performing assets and is still reserving a healthy bit of cash for the worst case scenario. This behavior by management is indicative of a risk management first culture. After establishing an understanding of a bank's risk culture and soundness, next we can focus on profitability. Any investment in a business is an investment in that company's future earnings, so profitability is a particularly important consideration for any bank investor. The first question, perhaps most obviously, is whether the bank generates a profit at all. According to data from the FDIC, 7.3% of U.S. banks failed to generate a profit at all in the first quarter. That's one in every 14 banks! 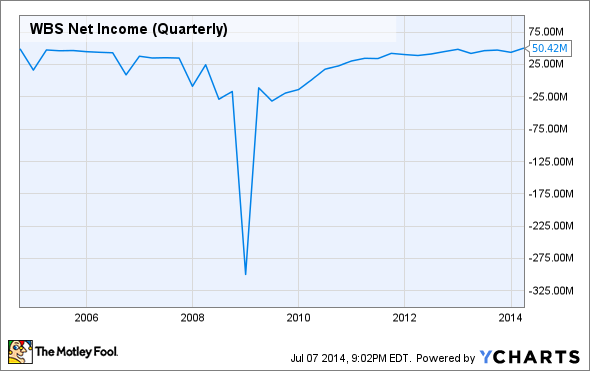 For Webster Financial Corp., the first calendar quarter of 2014 wasn't that bad. The company generated total net revenues of $205.1 million for the quarter -- that's total interest income plus non-interest income minus interest expense. Over the past 12 months, Webster Financial Corp. has generated $763.8 million in total net revenue. Of that revenue, 76% was attributable to net interest income, the difference between interest earned on loans and paid out to depositors. The remaining 24% was through fees, trading, or other non-interest revenue sources. The bank's primary focus is obviously on lending products, specifically to commercial and retail borrowers. The company does have a specific division that offers asset and wealth management, private banking, and other fee-centric businesses. However, based on the revenue mix it’s clear that Webster’s overarching focus is on the lending business. The bank was able to turn a profit margin of 25% on that revenue. For the first quarter, the company reported return on equity of 9.1%. Of the banks covered in this series of articles, the average return on equity was 8.9%. The FDIC reports that the average ROE for U.S. banks with total assets greater than $10 billion was 9.1%. In summary, Webster relies very heavily on its lending business to generate revenues. The company produced slightly above average profit margins and spot on the average return on equity. In light of the company’s strong asset quality though, these profitability results are satisfactory. Leverage is just part of the game with banks, so if you're a conservative investor who really focuses on conservative capital structures, the banking industry may not be the best place for your money. Adding leverage is an easy way to juice return on equity, which is, generally speaking, a good thing. The bank increases assets and thus earnings, while maintaining a lower capital level. The result is a higher numerator, a constant denominator, and a larger return-on-equity number. The math does the heavy lifting for you. 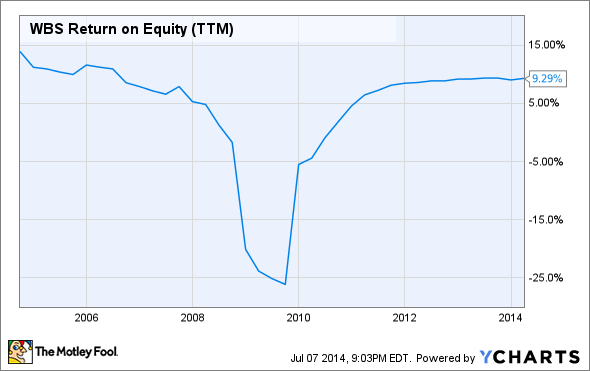 Webster Financial Corp.'s assets-to-equity ratio comes in at 9.5. The average of the 62 banks analyzed in this series of articles was 9.1. Webster Financial Corp. saw its revenues change by 1.4% over the past 12 months. That compares with the 5.7% average of the 62 banks analyzed. This change in revenue corresponded with a 6.2% rise in net income over the same period. The peer set averaged 14.1%. Fifty-four percent of all U.S. banks saw year-over-year earnings growth in the first quarter. Moving now to valuation, Webster Financial Corp. traded at a forward price-to-earnings ratio of 14.8, according to data form Capital IQ. That compares with the peer set average of 16.7. Webster Financial Corp.'s market cap is, at the time of this writing, 1.8 times its tangible book value. The peer set average was 1.9. Many investors use a general rule of thumb of buying a bank stock when the price-to-tangible book value is less than 0.5 and sell when it rises above 2. For me, that method is just way too oversimplified. It sometimes makes sense to pay a premium for a bank stock that places a high value on credit culture and asset quality. These banks will survive and prosper while others fall by the wayside. That security can be worth a premium. Likewise, a bank that relies heavily on leverage to achieve above-average return on equity may not be worth the price, even if price-to-tangible book value is low. That risk may not justify even a healthy discount in price. The company’s valuation metrics are about average compared to the larger peer group, which is likely driven by the company’s near average profitability, return on equity, and below average growth. For me though, the company’s asset quality is being underappreciated by the market.Based on the factors we’ve discussed here – soundness, profitability, and growth – Webster Financial seems like a bargain. The single most important factor for long term banking success is making high quality loans. Do that while making a profit and growing, and a bank has a pretty good chance for long term success.